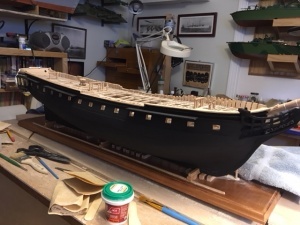 This blog describes the construction of a shipyard diorama showing the USS Constitution as she might have looked under construction and at launch. 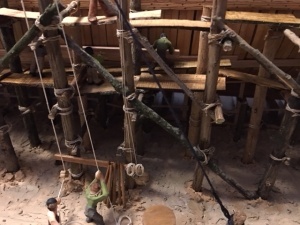 Next steps were to complete the scaffolding with planking and workers and add some carpenters to the decks. 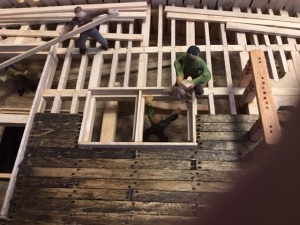 The planks used for the scaffolding were band sawed from small branches found around town. 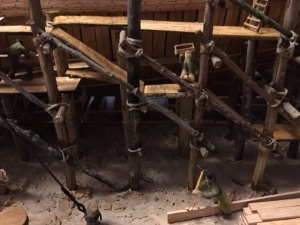 I also made up some ladders for the workmen to use in various ways, on the scaffolding as well as the hull. 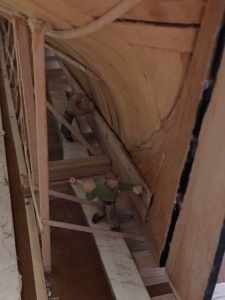 There are carpenters working on planking the hull and men walking up the scaffolding to work on deck. With the addition of a case and some lighting, the model was pretty much complete. I think that surrounding a model with a glass case is perhaps the only way to keep the modeler’s hands off it! 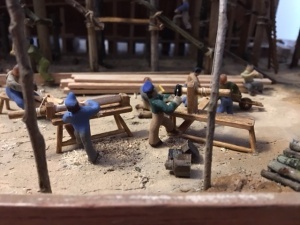 There are more detail pictures of the shipyard diorama on the Constitution Page. Now all that remained was to gradually fill in the remaining space with all the other activities I wanted to show. I put in first activities that were related to the two already modeled. 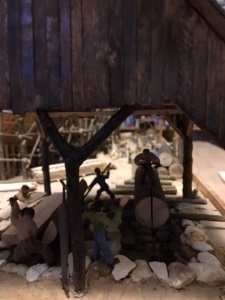 For instance, early on I modeled the charcoal kiln and the workers making charcoal for the forge and wheeling it to the smithy. At the same time, I build small boxes to hold metal stock and filled the shelves adjacent to the smithy. 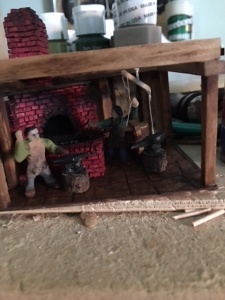 The charcoal kiln was made from Sculpey. I also made up several wheel barrows and a small wagon to hold various things. I used one for the charcoal, one for the deadeyes later, and the wagon to hold the deadeyes with iron work installed. 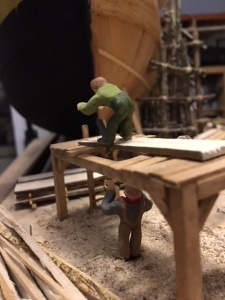 Then I went back to the other end of the shipyard, and made up a platform saw and modeled cut planks and the men handling them. Then I put in some timbers to make a floor for the second level of the saw shed and stored some planks there. 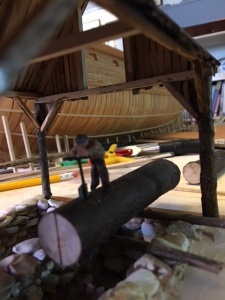 Then I had space to add the timber stock piles and some crosscutting sawyers. And piles of cut lumber for decking and planking. 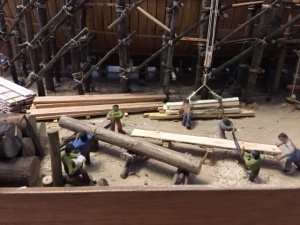 And the crews handling the cut lumber including the men rigging a load for the crane to lift onto the deck of the hull. 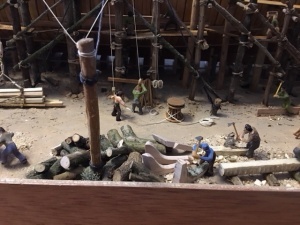 Then a pile of curved timber and crotch pieces and the men working to square timber and to adze the bentwood into shape for knees and other bracing timbers. Then a couple of pole lathes, one making deadeyes. And a man on a carving horse roughing out rough stock for spindle turning. 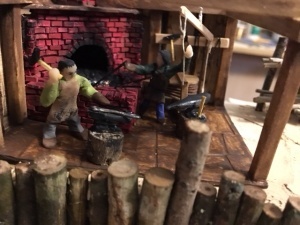 And a man drilling holes in the deadeyes and a man wheeling them to the smithy for the ironwork to be added. Now, with the addition of a few idlers and spare hands, the ground level of the yard was getting pretty complete. I added more detail on the ground, some litter and clutter, lots of sawdust, and used some gloss varnish to model the wet sand and shallow water at the end of the ways. It was getting to look pretty much as I wanted. 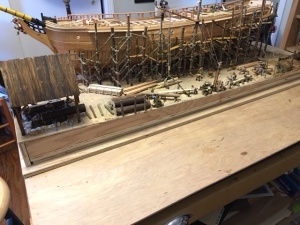 With the hull installed in the base, I began to create the shipyard scene on the unfinished, port, side of the hull. 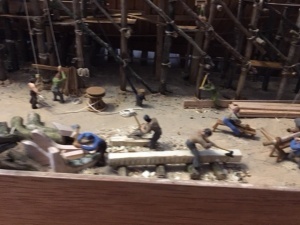 I wanted to show many of the activities that might happen in a ship yard of the late 18th century. 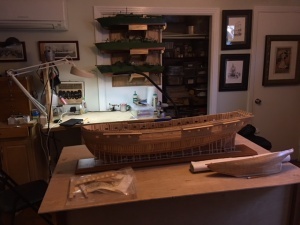 To do this, I had to compact some of these to fit in available space, and I also included activities that might not have happened simultaneously, but rather in linear stages as the hull was constructed. I started by building a shed to protect the two pit saws from the weather. 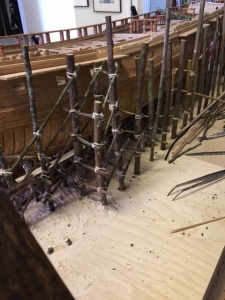 The pits were made up from small stones glued to mat-board, then installed into holes cut into the higher end of the base, near the bow of the hull. I then built the shed as a pole barn with open sides and made it high enough to provide lumber storage on a second level. The figures were made up from Sculpey(TM) polymer clay. 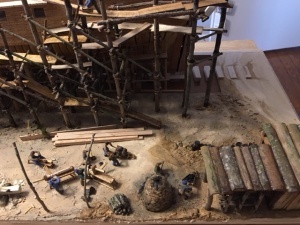 I collected fallen branches and twigs on daily walks through the neighborhood to use for modeling timber and to saw with band saw to make lumber. I also collected moss and lichen for later use in scenery. I modeled one pit actively sawing, the second pausing to off load cut planks. Once the shed was completed, I glued it to the base and then used latex wood filler to model the ground around the pits. Early on, it looked like this. Next, I went to the other end of the base and built up a bit of ground to install the “smithy”. I wanted to place the two structures at each end first, to better gauge the room I had for additional activities. 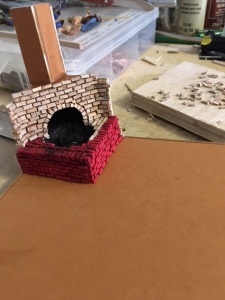 The smithy forge and chimney was built from small wood blocks glued to mat board, then painted. The whole thing was built on a small piece of mat board, which was then glued to plywood for mounting to the base. 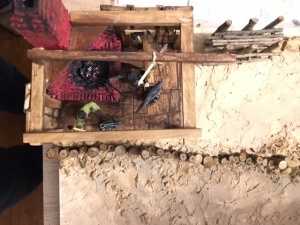 Once the timber framing of the smithy was done and walls added, I made up the bellows and a couple black smiths as well as anvils and tools to hang on the wall. Here the interior is nearly complete. 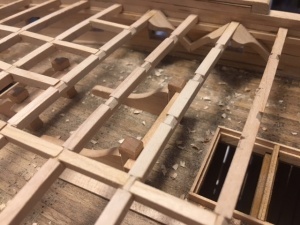 The mat board is ready to glue to plywood, which is then elevated on some small blocks to raise it above the level of the ways and to about the same height as the opposite end of the base. Here the smithy is fastened to the corner of the base and the ground around it modeled with wood filler. There is a line of pilings along the edge of the banking. Also, there are some shelves beside the forge area to hold metal stock. Another shot of the interior of the smithy with the smiths working on the iron work for deadeyes. Once I had the two shed structures at the corners, I next build the scaffolding along the hull. This was made from twigs lashed together. I did this next to see how much room it would require and how much room I would therefore have left for the activities I wanted to model. I first glued upright large pieces to the base. Once the first group was in, I added horizontal and diagonal bracing. Note that several of the uprights are taller, to form the crane to be added later. Here are shots of the first row of uprights, then some of the additional rows of uprights, the horizontal and diagonal bracing members. Note the large stockpile of twigs. 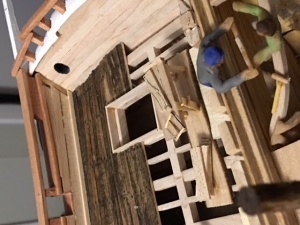 Once the scaffolding was roughed in, I modeled the ground with wood filler. The hanging knees are installed on the starboard side only. I have added capstans and various railings as well. At this stage, the quarter gallery and transom in place, I had a change of plans. 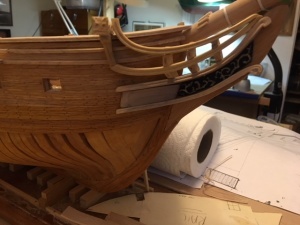 I had intended to leave the starboard side un-planked below the wales, but it looked kinda stupid, so I decided to fully plank the starboard side. Once the planking was done, I painted the entire starboard side. 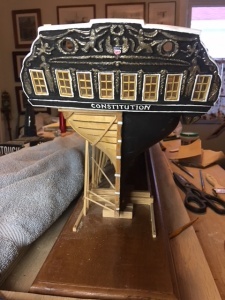 The Constitution was launched without her copper bottom, and was probably coated with tar from the waterline down, so I painted the entire side black. 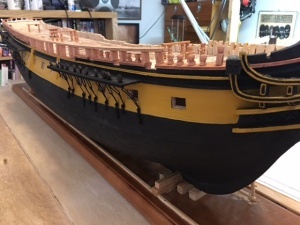 Then, another change of plans, and I decided to paint the stripe in yellow ochre, from the top of the wales to the channels. From what I had been reading, this would have been more likely the original color scheme. Also, it is likely that at launch, the vessel did not have lids on the gun ports, other than temporary lids fitted to the most forward port on each side, when underway. So I chose not to model the ship with gun ports. 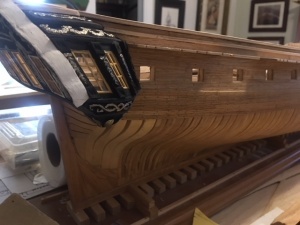 With the addition of the rails on the starboard side, the rudder, deadeyes on the channels, and painting the trim, the hull was ready to be mounted on the base for the diorama. 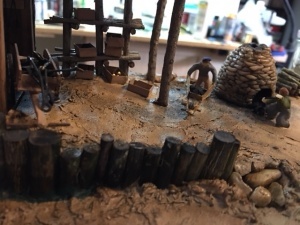 The diorama base was built on a slant. I recall visiting the sites of several New England shipyards from the early nineteenth century and being impressed with the fact they were largely just gradually sloping land that ran down into shallow water. One I visited had the remnants of a huge lathe used to turn masts and spars, which “machine” was simply a rugged pylon for one end, a movable stand for the other, and a tool rest similarly constructed. 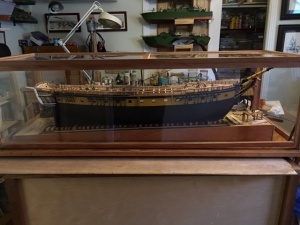 Those memories, together with review of available photographs of shipyards in the latter nineteenth century, formed the basis for the design of the diorama base. 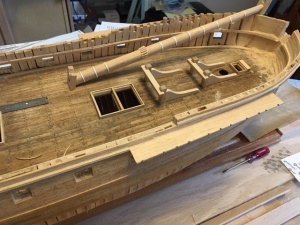 The hull was left mounted to the cherry board on the blocks as originally configured. 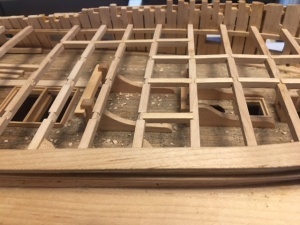 The base was constructed with an opening to allow the hull mounting board to slide in partially beneath the 1/8″ plywood forming the ground level of the base. At the stern, I placed a few more blocks leading into shallow water. 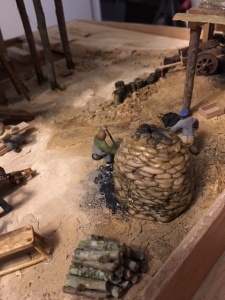 The surface of the ground was detailed with latex based wood filler in multiple stages, as the diorama evolved. 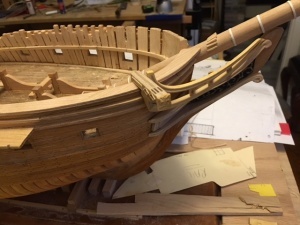 The starboard side of the hull is being completed above the wales, to about the point it might have looked at launch. No masts or spars, save the bowsprit, and not much equipment. Other than pumps, of course. The port side is left unfinished. Framed but not fully planked. The plan is to have this side surrounded by scaffolding with many shipyard carpenters working on planking and final finish work. This idea has a few glitches as it is necessary to complete some things in different order than might have been done for the real ship. 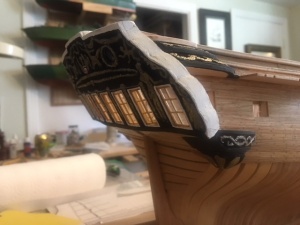 The transom, for example, is completely finished, carved and gilded in the model, as it just was easier to do the entire thing rather than just half. 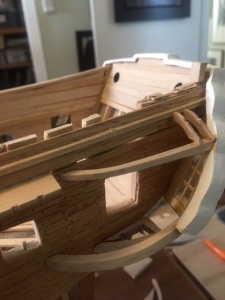 In another case, since I wanted to show the framing of the spar deck, I had to install the supporting clamp on both sides even though the ceiling had been installed only on the starboard side, and would, I think, have been completed before the clamp installed. Or maybe not. 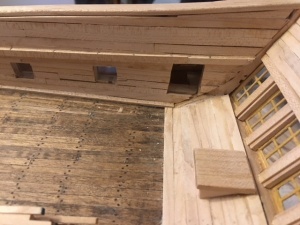 Also, I will build the diagonal hanging knees on the starboard side only but put the lodging knees and half timbers on both sides, since the hanging knees would be after the ceiling. 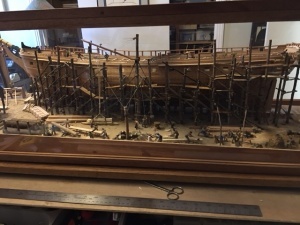 Since the intent of the project is a diorama to show the various tasks and skills that made up an old shipyard as well as to show how different the Constitution looked originally from how she appears today, I decided that strict attention to details of the how and when of the order of assembly of a ship was of secondary concern. And any errors will give the observant perfectionist plenty to see and comment upon. Here’s a shot of the portside quarter gallery framing. 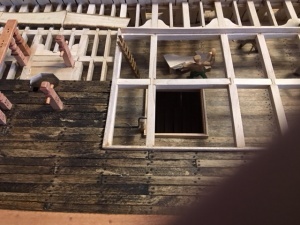 When the hull is on the base and the shipyard diorama started, the plan is to have this part surrounded by scaffolding with carpenters at work completing the framing and planking of the gallery. This is the starboard gallery completed and painted. Once I am further along with the building, I will paint the planking on this side also. Probably it will be black with a white strip along one of more of the trim strips. According to some accounts, Constitution originally wore a yellow ochre “Nelson checker” stripe between the open gun ports. Not sure about that, yet. Trailboards also carved, painted and gilded. 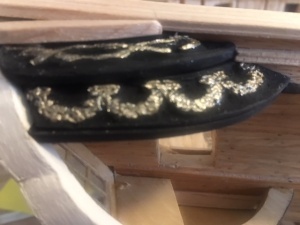 The decoration will later be extended back slightly toward the hawse holes. The rudder box. Note the ceiling and the clamp on the starboard side. Starting the spar deck framing. 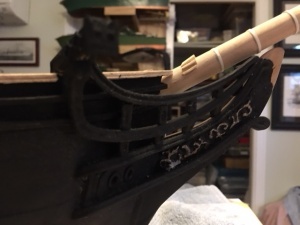 Riding bits added to the gun deck. I will not model the stove/galley as I would not think that would be installed at launch, but after. 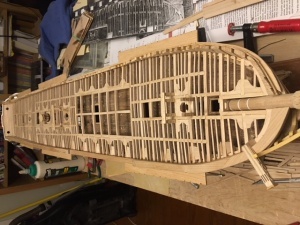 Another shot of the gun deck planking. You can see the ceiling on the starboard side, and also the first of the diagonal hanging knees supporting every other deck beam, straddling the gun ports on the gun deck. The openings in the spar deck railing for the guns on that deck are directly over the beam between these braced beams, between the gun ports of the main battery. You can see the notches in the beams to receive the carlins. The notches are cut with a blade and filed to final shape with a square file. 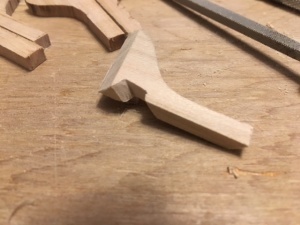 The ends of the carlins are cut to fit between the beams with “ears” extending from the upper end to fit in the triangular notch. This is a shot of the deck beams/carlings being installed, working from stem to stern. There are lodging knees and hanging knees also being placed. 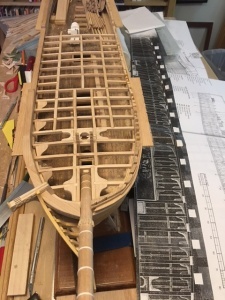 To the right of the model is a copy of a blue print from the national archives dated 1926, which gives the layout of the beams and knees for the spar deck and gun deck. The drawing was a presentation to some dignitary around the time of the restoration of 1927, and it is not clear whether it shows the beaming as found or as reconstructed. But either way, it is a very different layout from that shown elsewhere, as in the Marquardt book “Anatomy of the Ship”. 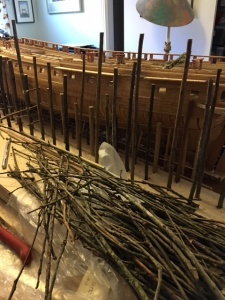 The location of the main beams, the pattern of bracing with carlings, lodging knees, and hanging knees differs in the two sources, so I am making a best guess as to what the original might have looked like. One additional difference is the number of full sized beams crossing the hull in the opening in the waist of the ship. In the 1927 version, there are only two beams fully crossing the hull out of a total of eight. 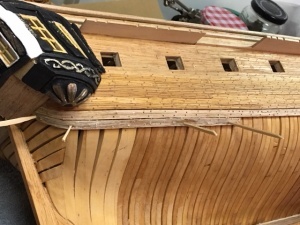 In the Marquardt version, a conjectural reconstruction of what might have been in 1812, there are nine beams, all of which cross the hull, one of which has a removable portion to allow access to the main hatch. I compromised on 7 beams crossing the hull out of a total of nine, the two beams left out being over the fore and main hatches. 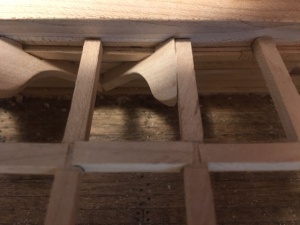 In addition, I made the center carling over each hatch “removable”, a feature shown on the Marquardt reconstruction. I figure my guess is as good as any other. Here are some shots of the hanging knees in process and in place. 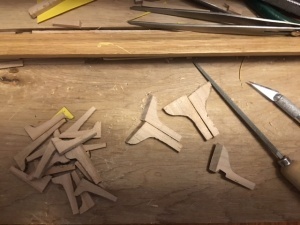 The blanks are cut on the band saw, then sanded to rough shape, and final fitted with a square file to make the notch fitting over the clamp. Ultimately, I decided on the hanging knee configuration that made the most sense to me. I used the Doughty draft to lay out the locations of the guns on the upper deck spaced evenly between the gun ports on the gun deck, then concluded that the simplest arrangement, two knees on alternating beams, would be the easiest way to clear the gun ports and still make the upper deck sturdy enough to carry the guns. The plan I used to construct the hull was obtained from the National Archives, and is the “Doughty copy” of the original 1795 draft plan, probably reflecting the Joshua Humphrey design most closely, as William Doughty was his yard clerk and draftsman at the time. This plan probably was the plan used to construct all three of the three heavy (44 gun) frigates, of the total of six frigates authorized by congress in 1794. 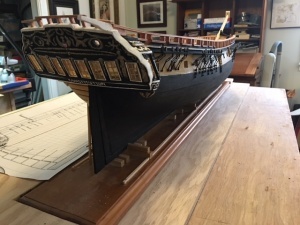 Although this plan survives, the frigates were built at different shipyards, and plans at that time may have been more guidelines than prescriptions. However, it probably pretty closely reflects Humphrey/ Fox/ Doughty design and intentions. It really is a revolutionary hull, as shown in the lines. Further, the construction is massive. Ribs are on average 22 inches wide with about 2 inches space between them. 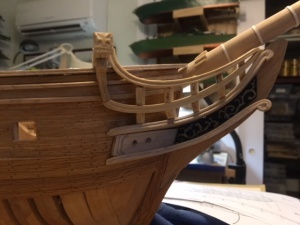 They are 12 to 18 inches thick, and with 4 inches of timber inside and out, the ship had walls of about 24 inches of timber. There were also other innovations in timbering as well as the shape of the hull. 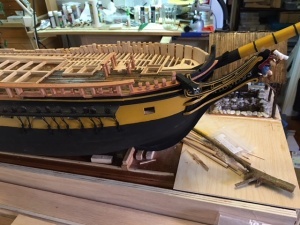 The model shows the rather extreme “make and space” of the original, and makes a good contrast to other vessels of the era, such as 12 pounder frigates like Raleigh and Essex. 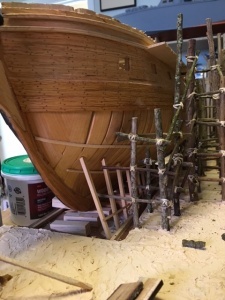 Here is a shot of the hull on the work bench. The smaller hull on the right is the Benjamin Latham, a mackerel seiner in the same scale. 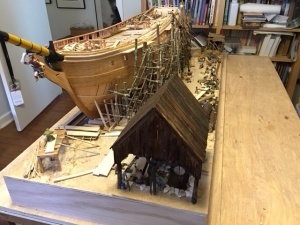 Another work in progress, the Latham is planned for use in a diorama of the boat at work catching fish. In this photo also, there is a small bag on the left containing some previously done sub assembly work. 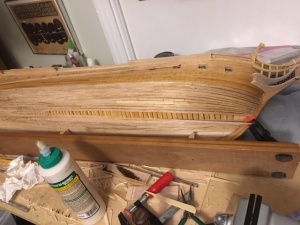 I had fabricated a transom for the model a couple of years ago, using various sources of conjectural reconstruction of what the original transom might have looked like. I chose one from the Marquart “Anatomy of the Ship” series based on contemporary descriptions and a painting by Corne. Since the Doughty draft showed very decorative quarter galleries, this conjectural reconstruction seemed consistent with that draft. More on the stern and quarter galleries later. The first steps included finish sanding of the inside of the ribs on one side for the ceiling planking. 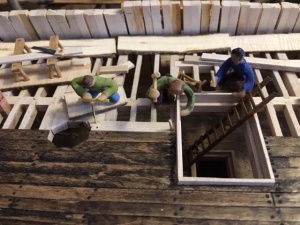 Once the ceiling was done, the next step was installing the clamp to hold the deck beams for the spar deck. The clamps are being glued in place. Using lots of clamps. 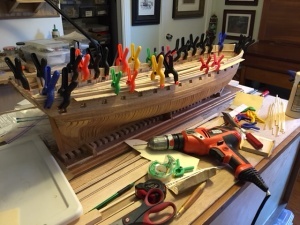 The clamps are in place, and now details are added to the gun deck. 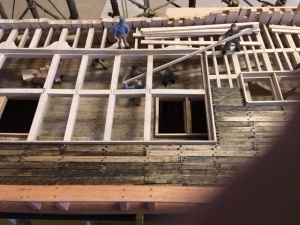 Hatch coamings, riding bitts, and bowsprit are being installed. Next steps are to add the cap rail, then the cathead, and then start on the head details. A shot of the head rails under construction. The trailboard is installed, but the hawse holes not yet drilled. The figure head will be discussed and modeled later. Then to the stern. Here is a shot of the transom installed. 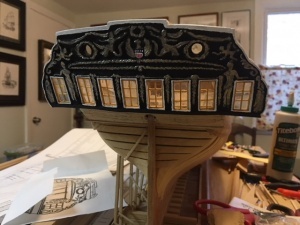 It is carved into boxwood, then the windows fabricated and installed and the assembly installed on transom framing to give a nice curve. I chose to gild the decorative carving on the transom. It is not known what the original looked like, but the elaborate decorations described in contemporary accounts, and knowledge of practices of the time, suggest this is an appropriate way to proceed. Quarter galleries are the next step. 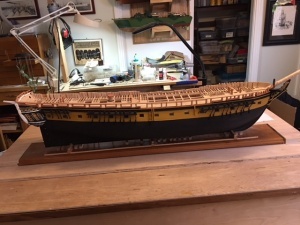 The starboard side is the finished side, and will be completed first. The port side will be framed only as described later. The decorative portions of the quarter gallery are carved from boxwood. The upper portion of the quarter gallery with gilded decoration.